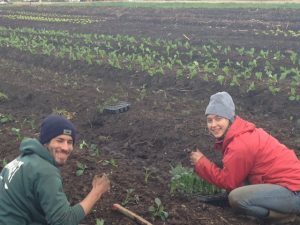 SPRING CSA CURRENTLY FULL FOR 2019! What’s available in Spring? Crisp spring radishes, juicy spring walla walla onions, rich spinach, pea shoots, bok choi, lettuce and kale to compliment overwintered parsnips, carrots, burdock, and beets. We anticipate the spring shares being heavy in hearty greens with compliments of fresh roots and over wintered roots. We hope to have our first harvests of asparagus as well. When? Between the weeks of April 11th – May 30th we will hold 6 pick-ups. The dates will be posted as we get closer to go-time. Where? Pick-Up will be held at Bell Street Chapel (5 Bell Street in Providence). Spring Shares will be pre-bagged, similar style to our Winter CSA. Pick-up at the farm is also an option. What day and time? Pick-up will on Thursdays from 5-7pm. Shares can also be picked up at the farm (1012 Snake Hill Rd N Scituate RI 02857) at more flexible times. How Much? $150. This will provide $25/share. Only one size share is available for the spring but feel free to order 2 shares if you prefer. Expect shares to increase in size as we move into May. Other Products? Eggs will be available for purchase at the CSA pick-up for $6/dozen.